Near Lock 51 about a mile from Hancock is the Bowles House, now Hancock's C&O Canal Visitors Center. At mile 122.96, above Lock 52, is the Tonoloway Creek Aqueduct, locally called the Bowles Aqueduct. This aqueduct is notable for the use made of the natural rock outcroppings on both sides of the creek. On the upstream side these serve for the aqueduct's abutment, resulting in an irregular arch. On the lower berm, where there is a waste weir, the spillway is on the natural rock. In 1865 the Division Superintendent reported a bad break in the aqueduct requiring major repair. 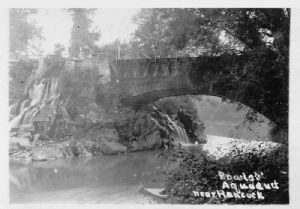 In 1870 Chief Engineer William R. Hutton warned that the aqueduct was "cracked in every direction, and in places has come to pieces, and fallen out." Also, the walls had bulged requiring iron rods to be placed through the work to strengthen it. During the winter of 1873-74 a wooden trunk was installed so that the berm parapet spandrels and arch could be repaired without affecting navigation when it resumed in the spring. The berm wall was rebuilt in 1874, but in 1887 Superintendent E. S. Mulvany saw the need for repair of the wooden trunks that had been put in the Tonoloway and Sideling Hill Aqueducts because of the previous collapse of their berm parapets. An engineer visiting the site in 1950 reported that the spandrels had fallen, and stones in the barrel of the arch showed "considerable disintegration." Now a footbridge takes the towpath across the aqueduct. This is a view showing the Tonoloway creek passing under the canal into the Potomac River. There is quite a lot of coal hauled down the canal. Boats pulled by mules. a slow way. This is my short trip this week i will get to rest today (Sat.) have had fine weather, no smokes so far or scratch cats. Feeling fine hope your people are all well. The description of the Aqueduct was written by Karen Gray and is found on the C&O Canal Association's website.